Pictured above from left: Dave Rigsby, DTE internal policy analyst; Lisa Lewis, Hopkinsville DES employment services specialist and Arthur Dunn, Caldwell Co. ATC principal look over student materials. 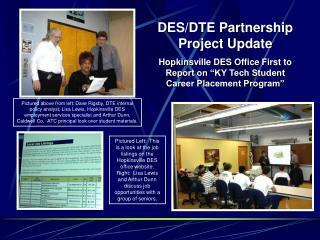 Pictured Left: This is a look at the job listings on the Hopkinsville DES office website. Right: Lisa Lewis and Arthur Dunn discuss job opportunities with a group of seniors. In January CWD Secretary Allen Rose announced a new project sponsored by the Departments for Employment Services (DES) and Technical Education (DTE) called the KY Tech Student Career Placement Program. 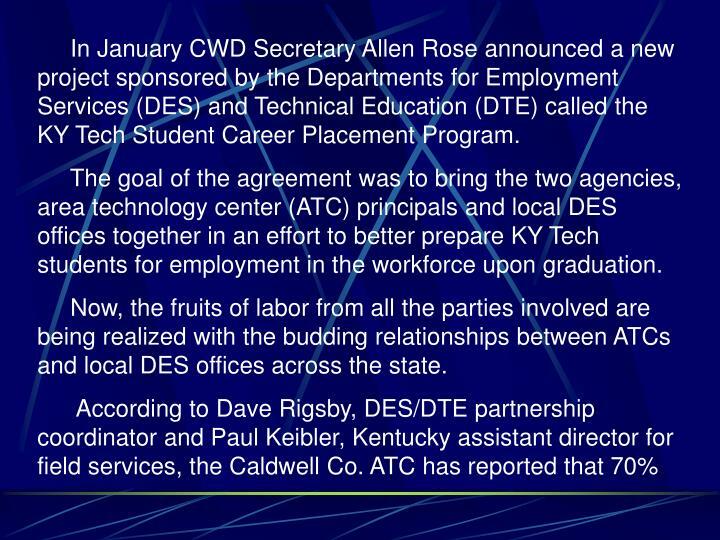 The goal of the agreement was to bring the two agencies, area technology center (ATC) principals and local DES offices together in an effort to better prepare KY Tech students for employment in the workforce upon graduation. 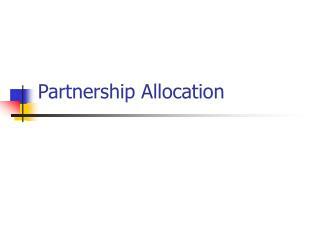 Now, the fruits of labor from all the parties involved are being realized with the budding relationships between ATCs and local DES offices across the state. 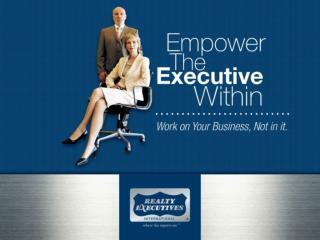 of its seniors have registered with the Hopkinsville local employment office. 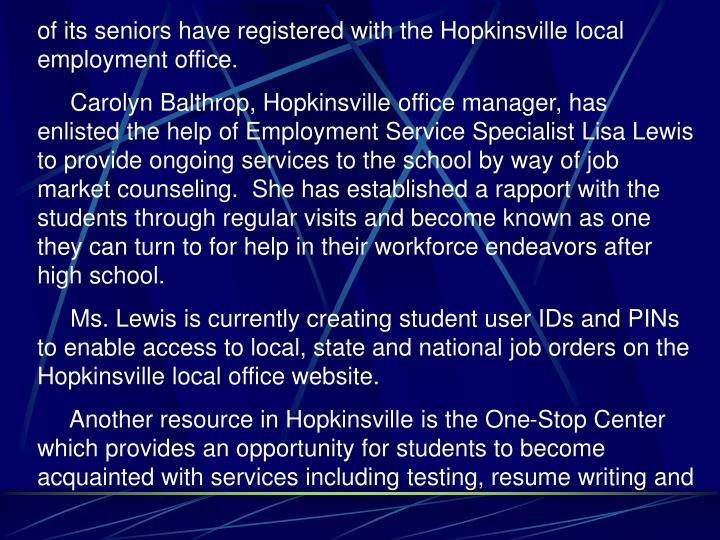 Carolyn Balthrop, Hopkinsville office manager, has enlisted the help of Employment Service Specialist Lisa Lewis to provide ongoing services to the school by way of job market counseling. She has established a rapport with the students through regular visits and become known as one they can turn to for help in their workforce endeavors after high school. Ms. Lewis is currently creating student user IDs and PINs to enable access to local, state and national job orders on the Hopkinsville local office website. 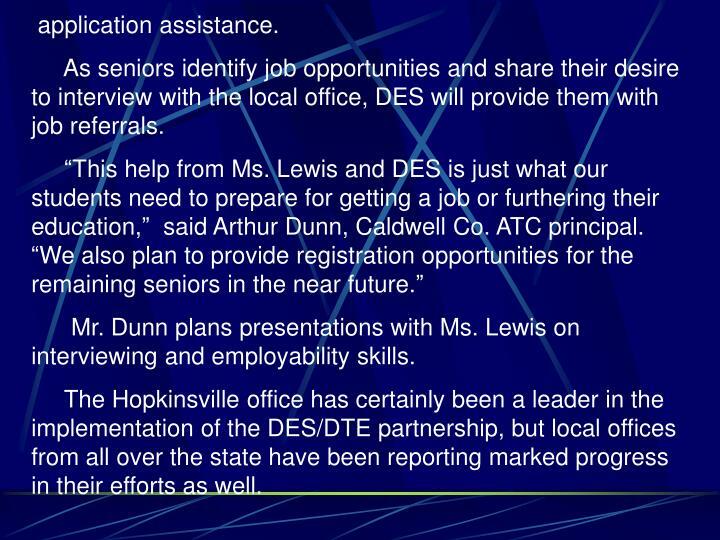 As seniors identify job opportunities and share their desire to interview with the local office, DES will provide them with job referrals. Mr. Dunn plans presentations with Ms. Lewis on interviewing and employability skills. The Hopkinsville office has certainly been a leader in the implementation of the DES/DTE partnership, but local offices from all over the state have been reporting marked progress in their efforts as well. Harrison Co. ATC Principal John Hodge has been assisted by Ted Beebe, Georgetown DES field office manager, to help educate and work with KY Tech students on services provided by DES. “Students now have a better chance of locating a job tied to the occupational training they receive at our school,” said Mr. Hodge. The center, conveniently located next door to the ATC, will be the site for a May 1st student training session. Gina Triplett, employer relations representative at the Paducah DES office, has provided partnership information to the Paducah Area Chamber of Commerce, Paducah Leadership Class 2003 and Alumni Board as well as the chamber’s Business and Education Committee. During the January meeting of the Paducah/McCracken County Steering Committee, Paducah DES office Assistant Manager Rhonda Fulkerson discussed the placement plan and provided copies to principals, counselors and teachers. 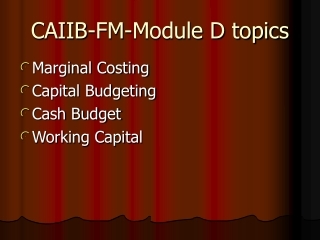 Investment Board meeting in March and discussed project goals with Kathy Gullett, director for field services. 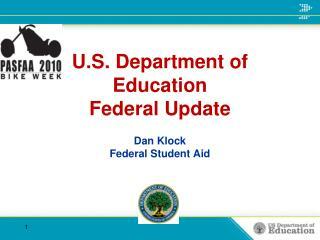 Rowlett and Paul Friedlander, field office manager for the Paducah DES office, discussed plans for seniors and some juniors to visit DES in April, register for work and learn how to use the resource area. 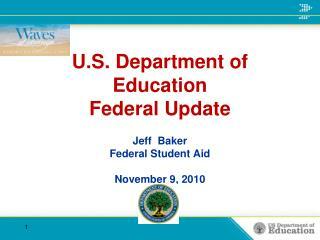 Ginger Counts, Mayfield DES manager, has contacted Mayfield ATC Principal Roger Pierce to discuss future program plans. 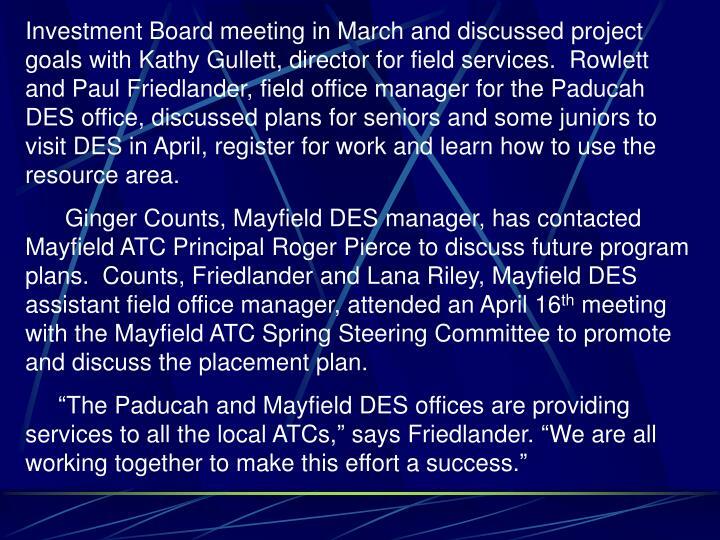 Counts, Friedlander and Lana Riley, Mayfield DES assistant field office manager, attended an April 16th meeting with the Mayfield ATC Spring Steering Committee to promote and discuss the placement plan. 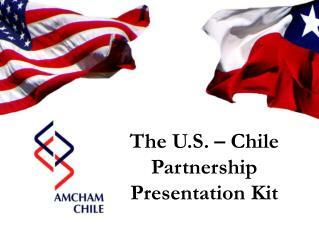 For more information, please visit its website: http://www.ajb.org/. Registering of seniors by self-registration prior to the end of the school year is being planned along with training sessions for teachers. 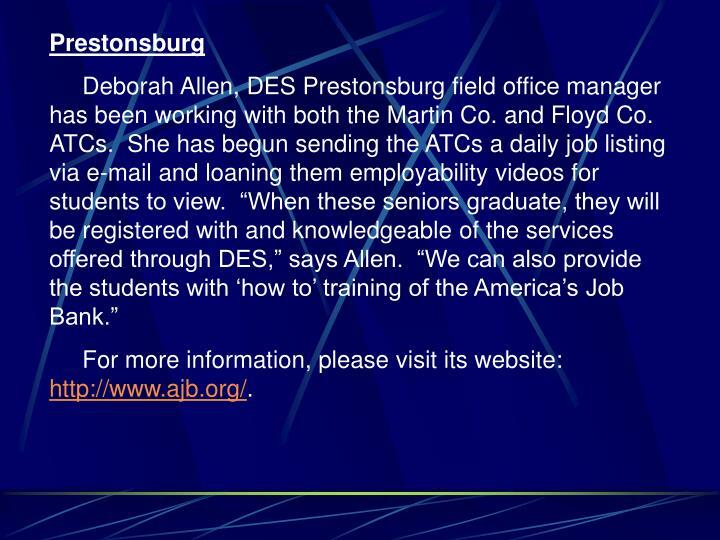 One of the most visible outcomes at the Prestonsburg DES office has been the addition of a co-op student from the Martin Co. ATC office technology program. Nikki Goble, a senior, is working 2 ½ hrs. 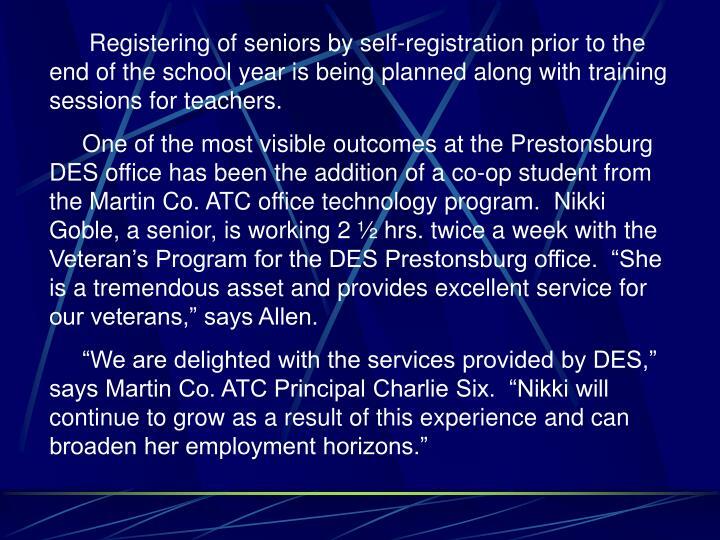 twice a week with the Veteran’s Program for the DES Prestonsburg office. 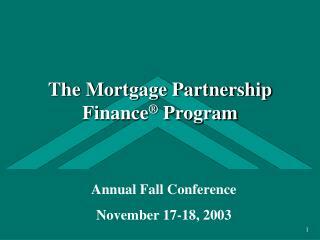 “She is a tremendous asset and provides excellent service for our veterans,” says Allen. 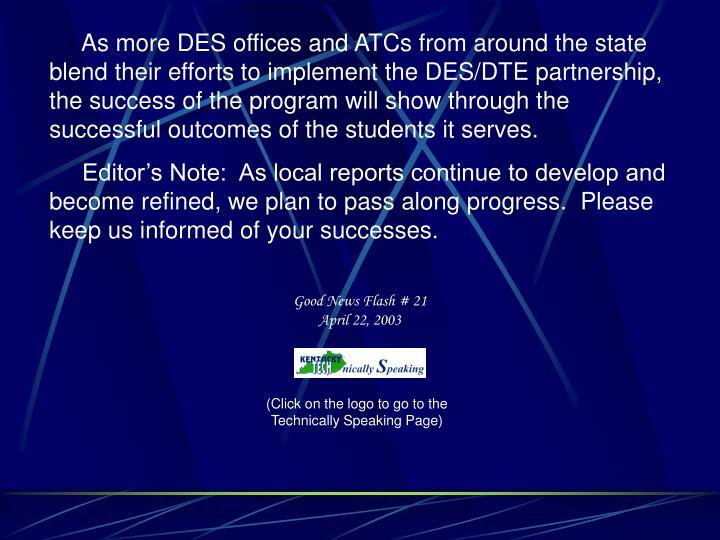 As more DES offices and ATCs from around the state blend their efforts to implement the DES/DTE partnership, the success of the program will show through the successful outcomes of the students it serves. 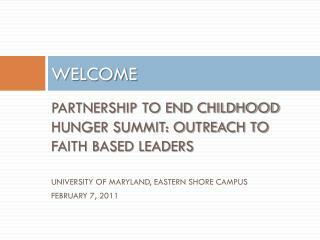 Editor’s Note: As local reports continue to develop and become refined, we plan to pass along progress. 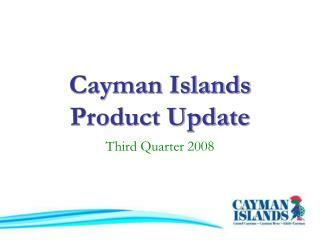 Please keep us informed of your successes. 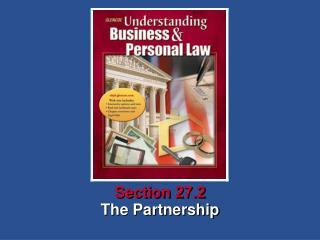 Section 27.2 -. what you’ll learn. 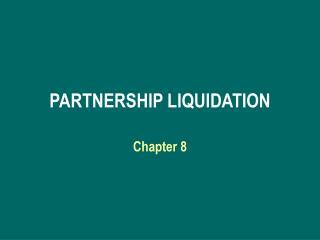 how to define general partnership (p. 588) how to identify the ways that a partnership can be created (p. 588). what you’ll learn. 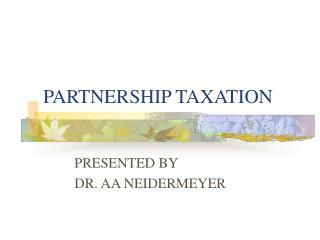 how to identify partnership rights in relation to property (p.
MDS 3.0 UPDATE -. 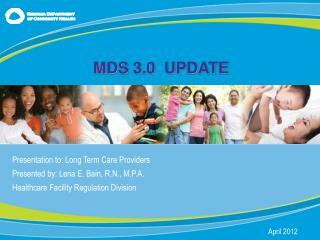 presentation to: long term care providers presented by: lena e. bain, r.n., m.p.a. 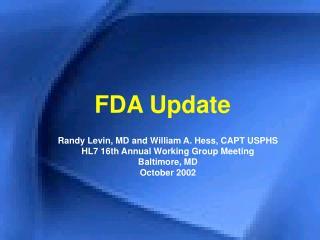 healthcare facility regulation division. 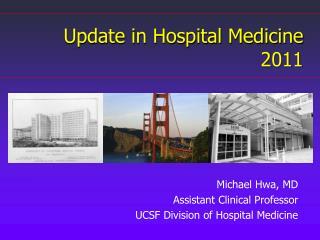 april 2012. mds 3.0 update effective april 1, 2012. mds 3.0. our journey continues. mds 3.0. 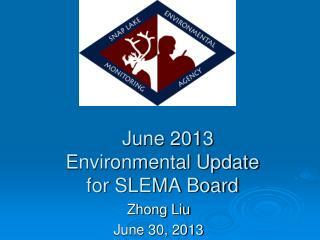 June 2013 Environmental Update for SLEMA Board -. zhong liu june 30, 2013. outline. 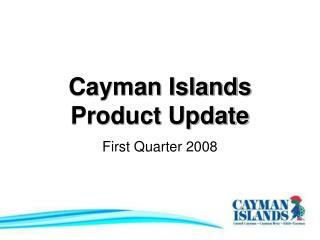 mine update inspection update regulators’ update aboriginal update stakeholders’ update agency’s activities slema reviews. 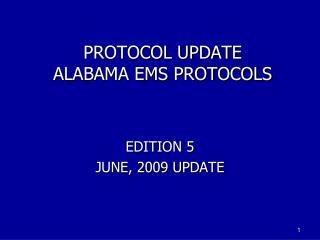 PROTOCOL UPDATE ALABAMA EMS PROTOCOLS -. 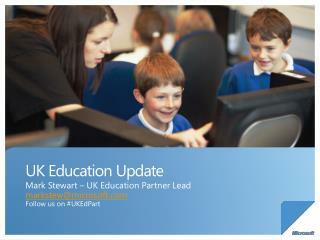 edition 5 june, 2009 update . 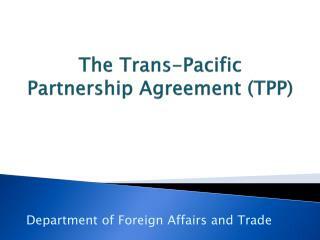 protocol update. 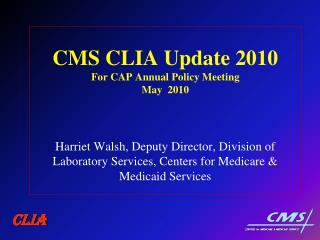 if you identify mistakes in the protocols or if you have suggestions for protocol changes email: john.campbell@adph.state.al.us. 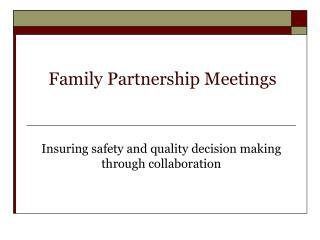 purpose of protocols .